The Beachy Amish are an Anabaptist church which formed in 1927 in Pennsylvania. The Beachy Amish church is also known as the Beachy Amish Mennonite Fellowship, reflecting Mennonite influences. Some argue that the Beachy Amish are more rightly described as a Mennonite group. In A History of the Amish, Amish historian Steven M. Nolt explains that the Beachy Amish movement emerged in the Old Order Amish community on the southern border of Somerset County, Pennsylvania over three decades. The Old Order community under the leadership of Bishop Moses D. Yoder maintained the position that social shunning should be upheld for members who switched to a more progressive Mennonite church. After new bishop Moses M. Beachy took over leadership, the church’s stance on strict shunning slackened, and “Beachy let it be known that he would not excommunicate or shun Old Orders who became Amish Mennonites” (History, Nolt p280). The progressive segment, comprising most of the community, eventually separated from the Old Order Amish over the issue of strict shunning in 1927. The Beachy church soon accepted Sunday schooling and began to adopt electricity in the home, followed by lessening restrictions on technology, such as allowing car ownership. Later, numerous others, including members of the “Peachey” church in Lancaster County, joined with the Beachy Amish contingent, which expanded across North America over the ensuing decades. Theologically, Beachy Amish share similarities with Old Order Amish as an Anabaptist church. Beachy Amish generally adhere to the tenets of the Dordrecht Confession. Ministers are typically selected similarly to the Old Order method (ie, through use of the lot). A bishop, two ministers, and a deacon typically lead the Beachy congregation. Steven Nolt notes that Beachy Amish retain a congregational aspect rather than organizing under centralized leadership, one way Beachy churches have kept with Old Order traditions. Beachy Amish women wear head coverings and Plain dresses, and men wear beards. However, Beachy Amish differ spiritually from Old Order Amish in that they emphasize doctrines such as assurance of salvation. They are also typically more mission-oriented than Old Order Amish. Beachy Amish have founded a number of congregations around the world, including in Europe, Latin America, and Africa. Beachy Amish also take a more organized approach to Bible study, including Sunday Schools and Bible study groups. Nearly all Beachy Amish use English rather than German as the language of worship. 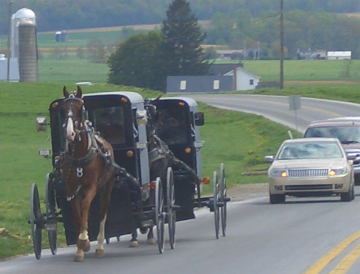 Beachy Amish allow a higher level of technology, including electricity in the home, automobiles, and limited use of computers, though they forgo television and radio. The telephone is also permitted in Beachy Amish homes. 17 responses to What’s the difference between Beachy Amish and Old Order Amish? I attended a Gaither Homecoming Concert in State College, PA, last year. There were a large number of people who attended the concert who were either Mennonites or Beachy Amish. Can you tell me which group it was who attended? I would think they must watch TV. How else would they be familiar with the Gaithers? I also see a number of the teenage girls who wear light colored dresses with white sneakers. Could you tell me, what`s a difference between Beachy Amish and New Order Amish? Or maybe this is the same? Horse and Buggy vs the use of cars. New order services are in German vs Beachy are in English. Not much else. I guess now my question is: what order of Mennonites dress somewhat similarly to the Beachy Amish, but listen to Christian music & will attend Gaither concerts? The girls wear dresses in pastels of yellow, pink, blue, or lavender, and wear white sneakers & white socks. The men seem to not have beards. John, “attending Gaither concerts” is not a defined practice of any particular religion. Perhaps you saw nonbaptized Amish young people, perhaps they were Mennonites, perhaps just ordinary folks who dress plainly. If you really want to know, you’d have to ask them directly. Most likely the girls at the concert were a type of Mennonite. Just because they were at a Gaither concert doesn’t mean they watch TV or that they aren’t church members. There are groups of Mennonites that allow computer and Internet access and that also are okay with Christian music. They could easily have found out about the concert online or something. Does anyone know in what areas of the country the Beachy Amish reside? There are Beachy churches in about 26 states. Gameo stands for Global Anabaptist Mennonite Encyclopedia Online. This article is about Beachy Amish Mennonite Fellowship. www.beachyam.org may also have information. Hi, could you please tell me the difference between the Beachy Amish-Mennonites and an Old order Mennonite group, such as Black Bumper Mennonites? Thank you so much for your time. Do Amish believe that Jesus is their saviour? Yes ! He that believeth and is baptized shall be saved. Mark 16:16. I have a comment on “The Amish in Garnett, Kansas” post, which you might want to go back to and read. Just a quick tip that might be of help for anyone who wants to refer back to a previous comment. If you copy/click on the link within any commment right next to the words “Comment on”, that will give you the link to go directly to that comment. In this example, the link is on the words “Get a direct link to comment” (directly below my name). Copy that and the link you get will take you right to that comment on its position on the page. Can be handy, if there are a lot of comments on a given post, and you want to jump right to a specific one. If that makes sense. I almost thought Beachy Amish live primarily by a body of water with sandy beaches, really. Then I read something about Peachy. What? I understand the difference between the Beachy and Old Order Amish, though. The Beachy Amish are a part of the New Order Amish that has a lot of them using electricity in their community and homes. The Beachy Amish even have automobiles they use and tractors. I read something about some computer use and telephones. So, modern technology is something that they use in their home life. The Old Order Amish don’t use modern technology in their homes. They use maybe oil lamps and candles instead of electricity. They use horses instead of tractors. They don’t use automobiles, but use the horses and buggy instead. I do understand that both of the New and Old Order have still got plain clothing they wear, accept that the beards are shorter in the New Order Amish like the Beachy Amish. I understand the young women wear some pastel dresses and some simple tennis shoes, also. Leave a reply to What’s the difference between Beachy Amish and Old Order Amish?